Advocate for stronger impaired driving legislation, enforcement, and adjudication at the community and state level. Provide a voice for victims of impaired driving crashes. Educate Montanans about driving under the influence; promote cultural change. In the United States, every day, roughly 29 people die in alcohol-impaired vehicle crashes. That’s one person about every 50 minutes. The 2016 total for DUI deaths in the United States was 10,497. It’s no secret that Montana has one of the highest fatality rates in the nation for the number of deaths caused by impaired drivers per vehicle mile traveled. Based on data from 2016, Montana had the highest DUI deaths/alcohol-impaired driving fatality percentage. With 45 percent of deadly crashes involving at least one driver whose blood alcohol content was higher than the legal limit of 0.08. In 2016, of the 187 fatalities on Montana roads, 66 were DUI deaths and 55 involved drugs, according to the Montana Highway Patrol. You might be asking why. 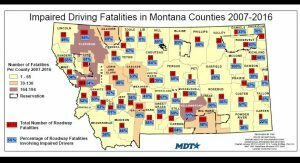 Why are there so many DUI deaths in Montana? There is no easy answer to that. 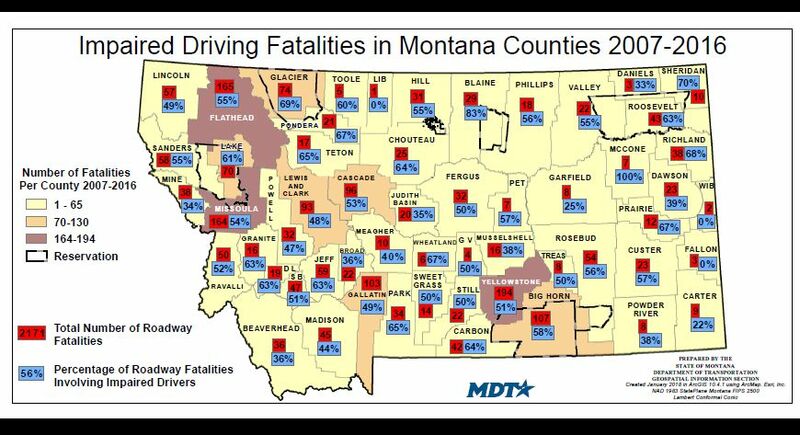 One thing that seems consistent is that drinking, and/or drinking and driving is a part of the Montana Culture. It’s as if we’re still living in the “Wild Wild West”. In many ways, it has become like a right of passage for young people. The challenge is to change behaviors, which are a part of Montana Culture. Unfortunately, driving under the influence is a complex problem, and the solutions are multifaceted. Here in Montana, we are working diligently trying to find real solutions to these very real problems.